Edhi died on the 8th of this month. Just twenty days later, media coverage and social calendars that were packed with commemorations have already gone sparse. The cruel reality of our times: nothing lasts forever. But Edhi has to be kept alive. Pakistanis live amidst high levels of uncertainty. Many suffer from food insecurity. Other basic requirements of modern living like electricity, water and gas are inconsistently available. Certain routes and discussions can be dangerous. The more the resources, the more predictability one can buy. The poorest are hardest hit of course, least protected, and with the least options. And for those, Edhi was a promise that help would arrive when things really hit rock bottom. 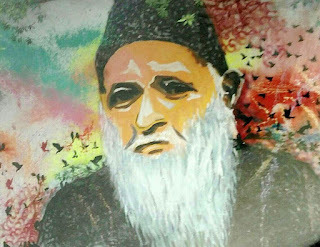 Who was Edhi, really? What he created gives a clue. Whether it be the trademark white Suzuki dabba Edhi ambulances, the foundation’s offices with tiled floors and sparse furniture, or the cradle outside the offices made of steel rods, everything said ‘don’t complain, just solve the problem’. It also said ‘be wise and keep costs low’ so donors trust us; and no contribution is deemed too small. And that is the kind of person Edhi seemed to be: a keep-it-simple, get-things-done, pragmatic person working for those who waited for help in dark times. For someone who started by picking unclaimed dead bodies as traffic whizzed by, the suffering and apathy he saw each day showed him that problems live on and we have to act. Now. Whether he was the true(est) Muslim; a radical leftist; a saint – that’s debatable. Living amidst chaos, our society clamours for a saint and a savior – the perfection that offsets the darkness of our lives. But a truer version of Edhi – of Edhi as a human – would serve us better. We need to rescue his memory from the museum of who-you-will-never-be; and accept his goodness and his many services to all of us with a pledge to be more like him. There are many questions that are unanswered about Edhi. About his work - what was his vision? What was his strategy around opening up so many centers around the country? What was the secret sauce? Would he change anything about what he had built? About his person - what were his core values? What were his sources of hope and optimism? Why wasn’t he scared? When people were abandoning their own homes, processions, mosques, schools, to save their lives, Edhi and his team were running towards the violence to pick up nameless faceless bodies. What was at the heart of this behavior – the Pakistani machismo, a saviour complex, a blind faith in God, a sense of responsibility, or something as simple as just-get-things-done? To celebrate Edhi is for many to own him. Instead of putting Edhi behind us as the saint who once lived, his work and his values can live through social and community leaders - those committed to fighting against inequality. Those who were mentored by him, his family and his closest associates, are the best suited to build the narrative of what was truly Edhi, his humanity, and not let him be hijacked as a perfection-you-can-never-be. His vision, his values, and his ideals can be systematically passed on to those who show up as students so that they use them to produce solutions to ongoing societal problems. And Edhi continues to live amongst us. Yes, and to learn from him, right? He organized and managed the intervention in his own style.